The patient is a 49-year old woman who presented with a 4.5 cm mobile mass in her right breast. A biopsy was performed. Histological sections show breast tissue with fibrosis, cysts and microcalcifications associated with ducts. There is a lesion composed of a spindle cell proliferation with a pseudocapsule. The cells are monomorphic, bipolar, spindle, with oval nuclei, arranged in a vaguely nodular, or haphazard ill-defined fascicles, intermingled with coarse short collagen bundles. There is focal mucinous change. No significant cellular atypia and/or mitoses are seen. Immunohistochemical stains demonstrate that the neoplastic cells are immunoreactive for SMA, desmin, and CD34. Cytokeratin (AE1/AE3), S-100, ER, Bcl-2, and P63 are negative. Myofibroblastoma of the breast (MFB) is a rare benign stromal tumor that has been described relatively recently in 1987. Very few reports exist in the literature, and the etiology is unclear. Isolated cases documented MFB in a setting of gynecomastia and androgen ablation for prostate cancer, at the site of surgical scar and with a history of trauma to the chest wall, or in a breast treated by radiation therapy. It occurs mostly in postmenopausal women and rarely, in older men. Patients usually discover a slowly growing, asymptomatic and freely movable unilateral nodule. Because it is not painful, it may reach up to 15 cm in diameter. Myofibroblastoma is one of the few spindle cell lesions that may arise in the mammary stroma. On imaging it appears as a smooth, well-defined encapsulated tumor without microcalcifications and may be confused with fibroadenoma, lipoma or hamartoma. The histological differential diagnosis on a needle core biopsy may be broad and includes a number of more commonly encountered benign entities of mesenchymal origin, such as nodular fasciitis, fibromatosis, leiomyoma, fibrohistiocytoma, adenomyoepithelioma and angiomyolipoma, solitary fibrous tumor and schwannoma. On excision, a reactive process secondary to the previous biopsy procedure should also be considered, such as post–fine-needle aspiration cytology reactive spindle cell nodule, nodular pseudoangiomatous stromal hyperplasia and inflammatory myofibroblastic tumor. A growing number of morphologic variants are being recognized, and an appropriately selected wide immunohistochemical panel is a key in confirming the diagnosis, especially when an unusual variant is encountered. In line with its myofibroblastic derivation, MFB is strongly immunoreactivity to smooth muscle actin, desmin, vimentin, and CD34. h-caldesmon is a useful marker to confirm a myofibrolastic differentiation if a leiomyoma is considered. Interestingly, MFB often expresses Bcl-2, CD99, and CD10. Reaction for S100 and HMB-45, cytokeratins, EMA, and c-Kit is negative. Myofibroblastoma shares similarities with other benign mesenchymal tumors, such as solitary fibrous tumor, and is regarded by some as existing on a continuum. Fibromatosis can usually be differentiated on the histologic grounds as it has an infiltrative growth pattern and is negative for CD34. However, in rare cases MFB may exhibit an infiltrating pattern with entrapment of fat and breast glandular structures (the infiltrating variant). Inflammatory myofibrolastic tumor also contains myofibroblasts, but it has a rich inflammatory milleu with a mixture of lymphocytes, plasma cells, histiocytes and eosinophils. MFB may contain a variable amount of adipose tissue, which constitutes over 75% of tissue in the lipomatous variant. Multinucleated floret-like cells, identical to those commonly observed in pleomorphic lipoma, have also been described. Spindle cell lipoma is also CD34 positive, but expresses S-100. There is usually little confusion with malignant counterparts of spindle cell tumors as myofibroblastoma has a very low mitotic activity and Ki-67 proliferative index. It does not exhibit nuclear pleomorphism, hemorrhage, necrosis, or metaplastic changes have. However, mild pleomorphism may be seen in a cellular variant. Myofibroblastoma is treated by surgical excision and given the fact that it is well defined and has a good cleavage plane, relapses are unlikely if the surgical margins are free of tumor. No reports of malignant transformation have been reported to date. Metry M, Shaaban M, Youssef M, Carr M. Myofibroblastoma of the Breast: Literature Review and Case Report. Case Rep Oncol Med. 2016;2016:1714382. Magro G. Mammary myofibroblastoma: a tumor with a wide morphologic spectrum. Arch Pathol Lab Med. 2008 Nov;132(11):1813-20. 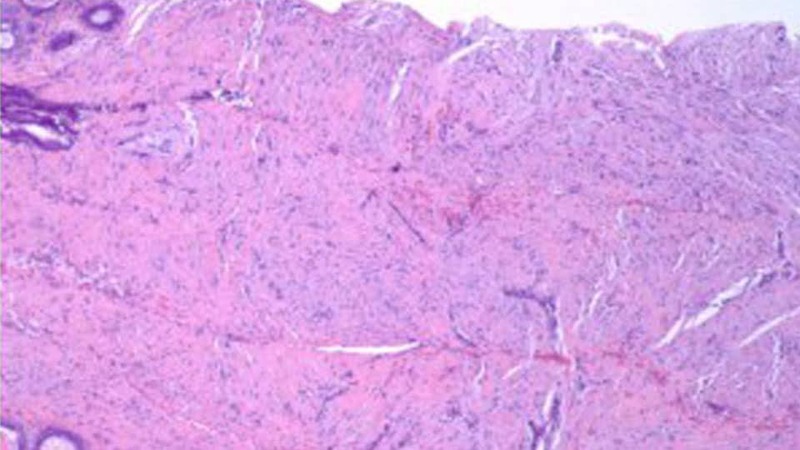 Mnif H, Charfi S, Abid N, Sallemi-Boudawara T. Mammary myofibroblastoma with leiomyomatous differentiation: case report and literature review. Pathologica. 2013 Aug;105(4):142-5. Mele M, Jensen V, Wronecki A, Lelkaitis G. Myofibroblastoma of the breast: Case report and literature review. Int J Surg Case Rep. 2011;2(6):93-6.